Angelya over at Revive & Rejuvenate held a Harvest Festival contest, looking for the best recipe for this year’s in-game event. 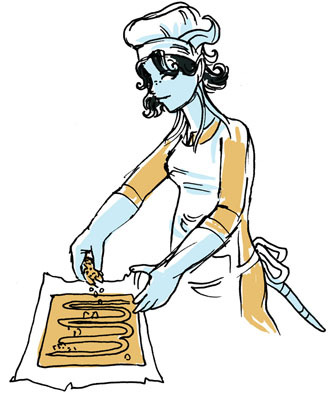 She contacted us about the contest and we agreed to host the winner, so here’s the recipe from Vidyala over at Pugging Pally! The recipe is copied straight from her blog (with permission, of course), and these cookies certainly look delicious! 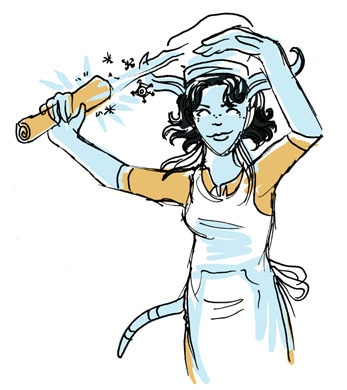 If there’s something everyone knows about mages, it’s this: we’re awesome with baked goods. It’s true! In-between devastating things with the powers of frost, fire, and the arcane – we’re the perfect folks to sit down and have a biscuit with. Light something on fire? Yes. Make some awesome strudels? Got you covered. My spoon? Did I take it from a murloc? Why would you ask something like that? It’s come to my attention, however, that not everyone has this ability. 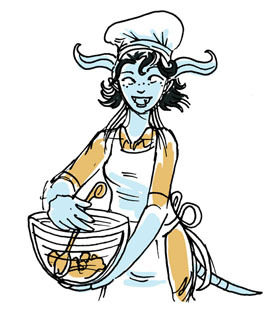 Some of you non-mages, without access to a good mage… you’re going hungry. My heart goes out to you. I have devised a clever way for you to enjoy something very akin to true mage delights. They aren’t conjured. But they’re the next best thing. Here’s what you’re going to need – since you can’t make them out of thin air and all. It’s okay, don’t feel bad. 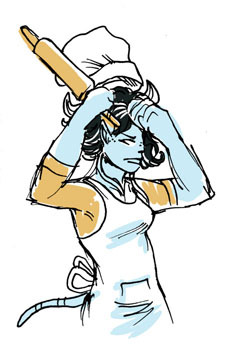 We can’t all be mages. Okay, do you have all of those things? Here’s what you are going to do with them. Put the butter, crystallized honey, and sugar in a bowl. Then cast an animation spell on your spoon and go and… wait. You can’t do that, right? Well, I guess you have to – here, I’ll try to do it that way too, this can’t be too hard. On second thought, it really may be preferable to mix them the normal way. With magic. What do you mean, "That's not normal?" So, you are going to engage in arduous physical labour until those three things are combined. You can stop and take a break at this point, I did. Then you are going to add your small egg and enriched terocone juice. It adds an unusual, woodsy flavour! Beat it again until it is smooth. The texture should be a bit like wet sand. Next, in another bowl, combine your simple flour with the vision dust and salt. It’s just a tiny amount of salt. The vision dust will make sure that your end result is something like magic! Add the powders to your sugar mixture and stir it by hand again just until you have a soft dough. If you overmix it, your end result might be too hard so try to avoid that if you tend to get overzealous with the mixing. (Hint, don’t ask a more martial friend to “assist” you or you may find your dough harder than a rock and have to start all over again. Hypothetically speaking). You should have a soft lump of dough at this point. Lay your soft dough on a piece of common parchment, and then put another piece over top of that one. 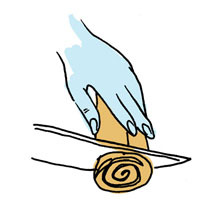 This’ll keep your dough from sticking to anything else and let you roll it out properly. 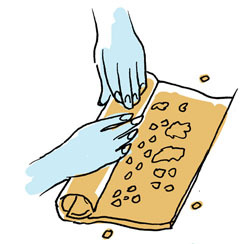 Roll the dough gently between the parchment until you have a 12″ square. Yes, gently. Exactly. Just like that. I know the rolling can get a bit frustrating, but maintain your composure. Otherwise the integrity of your cookies may be compromised. All novice mages learn the importance of concentration to the end result of a spell. How did this picture get in here? Clearly it's a fabrication. It can be tough to achieve a square result just by rolling – you can use a dull knife to trim the edges. Once you’ve achieved that perfect square, place it on a cookie sheet and chill it with a frost… oh, right. Well… You could put it in a cold room for thirty minutes. If you don’t have one of those, you could put it into the Northrend air – but not for more than fifteen minutes! Fifteen minutes or a good freezing spell will do the trick. 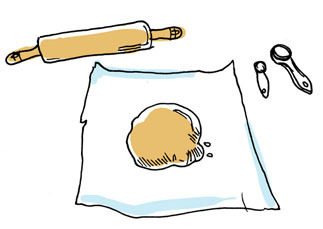 After your dough has chilled, take it out and peel off the top layer of parchment. Drizzle your honey evenly over the square of dough, then sprinkle it with crystallized honey, holiday spices and nuts. Try to get it almost to the edges. Now comes the tricky part. Take the edges of your square and quickly begin to roll it upon itself. I say “quickly” because if you hesitate too long with it, it may begin to crack. The end result, unlike a spell, will probably still be tasty but not quite as attractive. 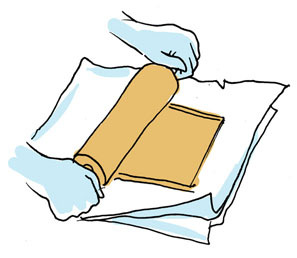 Wrap the resulting log in parchment (waxed paper or plastic wrap). You can use the paper to add cohesion to the roll if the shape of it is a bit odd. Try and smooth the seam as well, it will make it easier after the next step. Now you have to freeze it! You can do this by taking it and putting it someplace cold for at least three hours (or up to three months, although why would you want to wait that long to eat these? You don’t, trust me). You should be able to find plenty of cold in Northrend, watch out for the ravenous monsters and undead, though. Or find a friendly neighbourhood frost mage! More fun than fighting Scourge for a patch of clean snow, let me tell you. When you’re ready to bake the cookies, get your oven fired up nice and hot (350 degrees F). Peel back the parchment covering the cookie dough and use a sharp knife to slice it into 1/4″ thick slices. 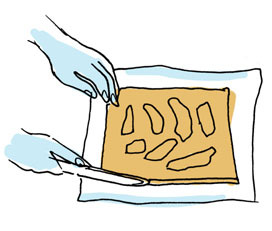 Place these one inch apart on a greased cookie sheet (sprayed with non-stick cooking spray). Parts of your dough may crumble at this point. You can still push them back together and put them on the cookie sheet. They'll probably cook in one piece. 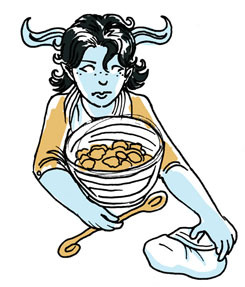 Bake the cookies for 12-15 minutes or until they’re pale golden. There’s a simple cantrip you can use to alert you when that amount of time has passed, it’s… wait, nevermind. Well, keep an eye on your hourglass! You wouldn’t want them to burn. Let them cool on the cookie sheet for a few minutes before putting them on a wire rack to cool. They can be a bit tricky to move if you wait too long, and may fall apart if you try before it’s been a few minutes! 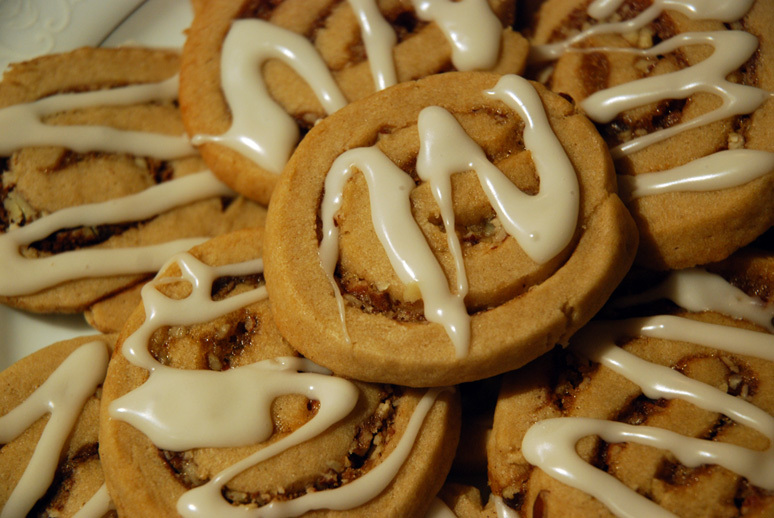 Once the cookies are completely cool, you can drizzle them with a little frosting. It’s included in the ingredients at the beginning of the recipe! Really simple. Combine all three things in a bowl and mix until smooth. You may have to add a bit more Oshu’gun Crystal Powder or milk to get the right consistency (I like mine to be a bit thicker). What is that powder, anyhow? So exotic! I’m sure it’s safe for purposes of eating. Quality control is very important. And that’s it! 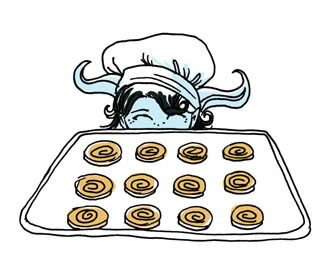 Enjoy your cinnamon bun cookies, which may not have all of the benefits of conjured baking but are still guaranteed to be very tasty! They are best enjoyed with a nice glass of ice cold milk. These delicious chocolate morsels were once only available by braving ravasaur and ooze, pterrordax and silithid, just to meet with Mor’vek in the bottom of Un’Goro and have him tell you that you must first embark upon a quest to harvest the rich cacao nibs that grow in the volcanic soil so coveted by druids…while facing more ravasaurs, oozes, pterrordaxes and silithids. Now, thanks to the ingenious con-job…um…that is…perseverance by Shizzle, who finally made his flying machine and winged it back to Gadgetzan none the worse for wear, these treats can be yours…for a price! 1. Preheat oven to 350 degrees F (175 degrees C). Grease and flour an 8 x 12 inch pan. 2. Cream butter and sugar together. Add eggs, water and vanilla and mix thoroughly. 3. Sift in cocoa and flour, and beat in remaining ingredients. 4. Spread batter into prepared pan. 5. Bake in preheated oven for 25 to 30 minutes, or until a toothpick inserted into center comes out clean. Do not overcook. These are great as is or frosted. To make frosting, combine 3 tablespoons butter, 3 tablespoons cocoa, 1 tablespoon honey, 1 teaspoon vanilla, and 1 cup confectioners’ sugar. Frost while still warm. It was always like this at this time of year. A slight chill in the air, the warmth of the fire in the hearth, and the crisp silence of Fall. Today was a special day, though. Her son had returned from that horrible war in the North, a little worse for wear, but still alive. It was more than most could say. Today, though… celebration, and with it, his favorite dish. At this point, you can remove it from the heat and let it cool for a few minutes. Then add the milk, egg, and baking soda, and blend it all together. Now, it will froth a little, but that’s okay so long as it doesn’t go over the top of your saucepan. Once you get this mixed together, you can let it sit aside for a minute or two. Now you sift the flour, salt, ginger, and cinnamon together in a large bowl. If you don’t have a sifter, you can use a sieve and a wooden spoon, but it doesn’t work quite as well. When it’s all sifted together, make a well in the center. Pour in the molasses mixture, and blend until smooth. Now that it’s all together, you’ll want to spray a non-stick cooking spray onto a preheated waffle iron. Add some of the mixture to the iron, and let it heat until fully cooked. (The actual amount you need to add to the waffle iron depends on the size of your waffle iron.) Then you can top with your favorite waffle toppings, and enjoy. From Smokywood Pastures to you – have a wonderful Fall. Nourish! The Azerothian Menu is powered by	WordPress 3.3.2 and delivered to you in 0.249 seconds using 28 queries.